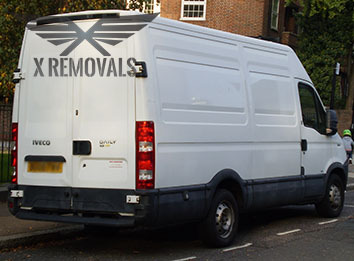 At X Removals we have a long and well-established tradition of providing high quality, affordable and dependable professional man and van and van hire in London services that will be suitable for a variety of relocation projects, both domestic and commercial, that you might have on your hands. No task is too big or too small for our packers and movers. Full property relocations – domestic removals, office moving etc. Our vans are comfortable and well equipped to ensure the safety of your goods while on the road. If you deem it necessary to have a trained, licensed mover (or movers) by your side on your moving day, we will be pleased to send such. Alternatively, you can go for a man and van service in London from us simply for the vehicle, e.g. we can offer you comprehensive van hire options as well. Moving of any sort can be easy and hassle-free when you have the right contractor working for you. We are ready to be at your service around the clock for assistance, moving tips and other benefits throughout the full duration of the project – from the initial planning to the moment when the last box is unloaded at the assigned location. In addition to the regular man and van in London service, we will gladly provide you with packing assistance/supplies, as well as storage, rubbish removals and other services. A man and van in London from our team and fleet would be perfect for a variety of delivery services as well. For more information on the conditions under which you can hire a man and van in London from X Removals, please do not hesitate to contact our polite, helpful and knowledgeable around the clock customer support. Our specialists can be reached at any time of the day and night and would provide you with helpful information, booking options, free quotes and moving advice that will definitely make you moving job a much less stressful experience. Count on us in every situation. Many people think of London as a cosmopolitan city and home to some of the most popular tourist attractions in the world – Westminster Abbey, London Bridge, Big Ben, etc. But London has another side too – some of the best suburbs and residential developments in the country are located there, especially in the South London Boroughs of Lambeth, Croydon etc. The London Metropolitan Green Belt, created in the middle of the previous century, encompasses a considerable portion of those suburbs, creating small towns within the city that are truly magnificent. And they are a 20 min. train-ride away from the heart of the capital.